Dogmeat returned in 1998's Fallout 2 as an Easter egg for players who invest heavily in the Luck stat and explore the well-hidden "CafÃ© of Broken Dreams." There are other dogs in the game - K-9 and Pariah Dog to name a couple - but none compares to Dogmeat, who boasts a new feature in the sequel: "Accidentally" shoot him and a man named Mel will try to kill you. Yes, that Mel. "Dogmeat was definitely inspired by The Road Warrior," says Cain. "Leonard Boyarsky, the art director ... had that movie running continuously in his office, and I think he remarked on several occasions that having a dog in the game would be really cool. [It's] why we wanted a dog in the first place." Many pieces of the Fallout games were inspired by The Road Warrior, from the opening "newsreel" monologues (narrated by Ron Perlman of The City of Lost Children, another inspiration according to Cain) to the games' stylized leather armor and medical braces. One of the most vivid images from Bethesda Game Studios' Fallout 3, the latest installment in the series, is that of the Lone Wanderer with Dogmeat by his side, a mirror image of a scene from Mad Max. Even the breed is the same: Both are Blue Heelers, known for their loyalty, trainability and heterochromia (one blue eye, one brown eye). 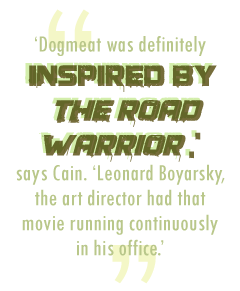 What isn't derived from The Road Warrior is Dogmeat's name; that likely comes from a scene in the 1975 film A Boy and His Dog where Vic (Don Johnson) refers to his mutt as "Dogmeat." "A Boy and His Dog inspired Fallout on many levels, from underground communities of survivors to glowing mutants," says Heinig. "My understanding is that (Fallout designer) Scott Bennie settled on the name 'Dogmeat' for the character, and it's likely that he did pick that from the story in question." Good thing, because according to Bennie, Dogmeat's original name was "Dogs**t."
In the original Fallout 3 (aka Van Buren), designed to near-completion by Black Isle, there were no plans to bring Dogmeat back, but fortunately for dog lovers he made it into Bethesda's version as a presumed descendant of the original dog who - according to the developers - perished in a "force field accident." Fallout 3's Dogmeat not only follows and defends you, but will fetch food, ammo and weapons (even boasting the curious but helpful ability to pilfer things from locked containers). When he goes missing, he can often be found waiting patiently outside Vault 101, perhaps inspired by the final scene from A Boy and His Dog where "Dogmeat" waits outside a vault for his owner. Dogmeat's primary purpose in Fallout 3 is to serve as a guard dog: He's the most perceptive, agile and enduring of all followers and fast enough to run down most foes. However, he's not very smart, inheriting the "oblivious to danger" gene from his predecessors. Left to his own devices, he'll happily attack even the strongest foes in the game, including the dreaded Deathclaws who will shred through his 500 hit points in a matter of seconds. Fortunately, a perk called "Puppies!" included in the Broken Steel add-on will reincarnate Dogmeat as a puppy with twice the hit points no matter how frequently he gets himself killed.